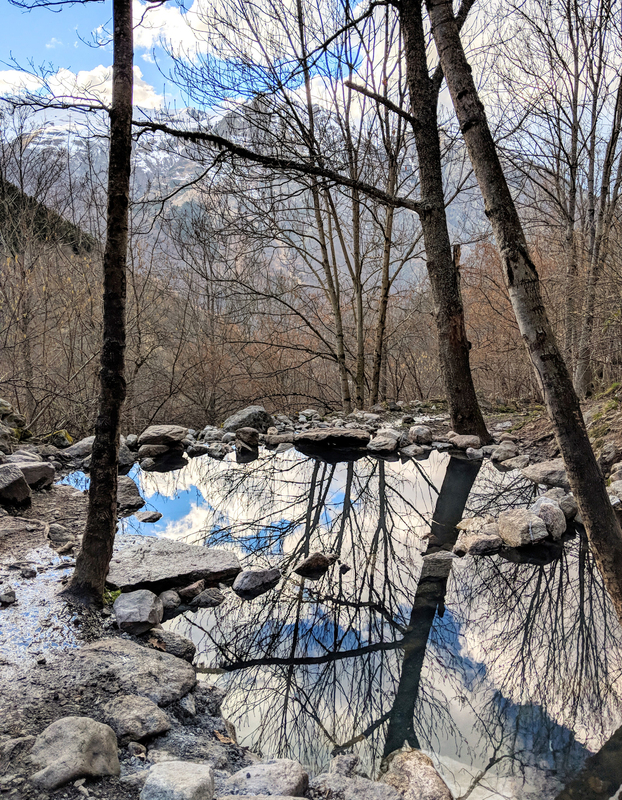 Earlier this month we were invited to the South of France, to enjoy a long weekend in the Pyrenees Mountains, at Ax 3 Domaines. 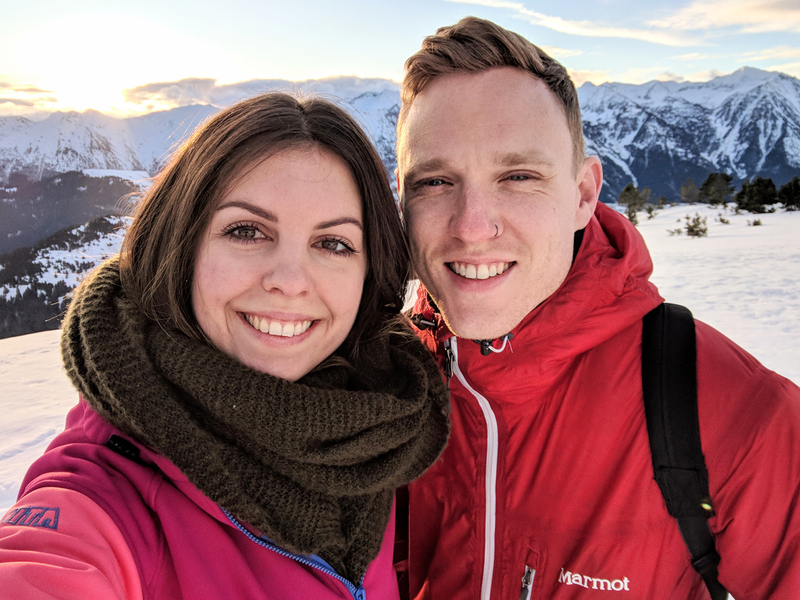 Having never been skiing or snowboarding before (or visited a snow resort before! ), we were a little nervous, but super excited. It’s one of those opportunities we couldn’t pass up! 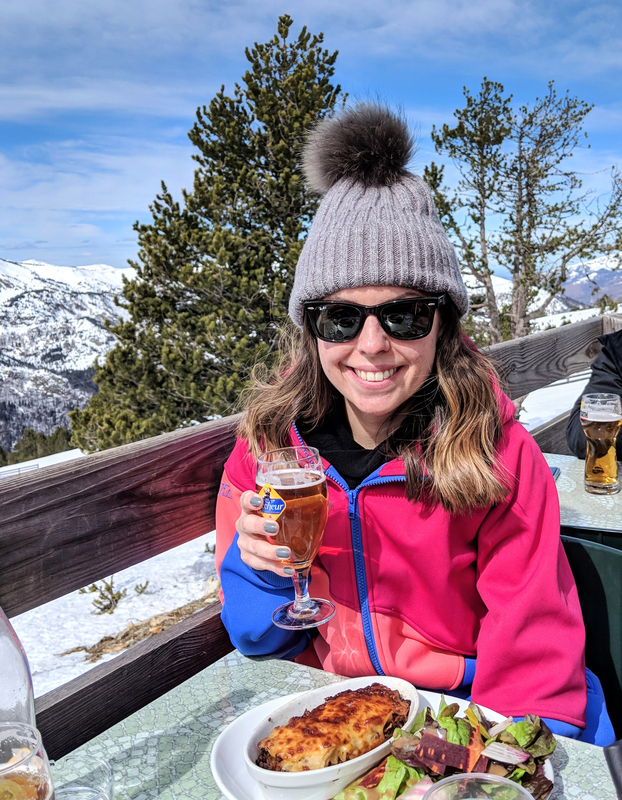 Borrowing ski gear from our friends, and receiving tips from everyone who had been before, no sooner had we received our itinerary, we were jetting off to Toulouse. Toulouse is the closest airport to Ax 3 Domaines, just over an hour’s drive from the resort of Ax Les Thermes. 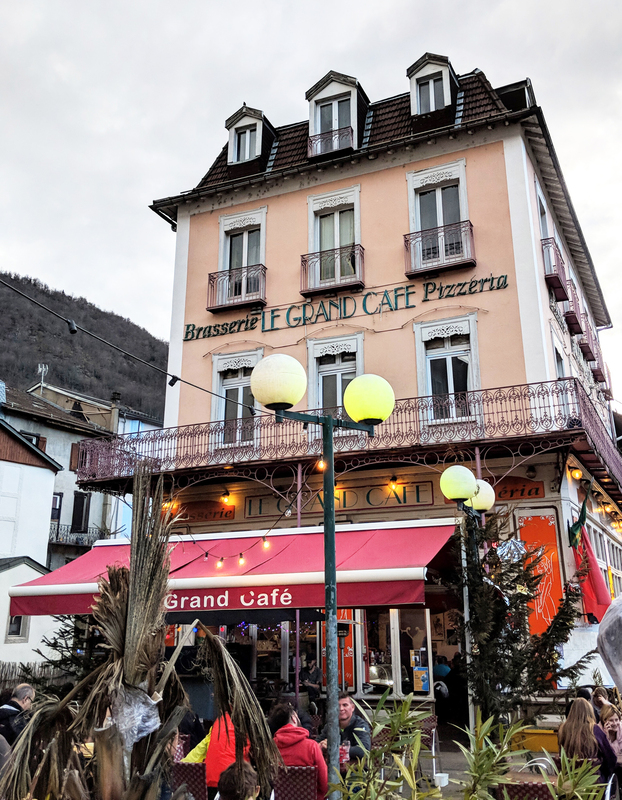 Here we stayed in a lovely hotel called La Residence, which offers self-catering studios, breakfast and spa facilities, and happens to be a short walk from the gondala that takes you up to Ax Bonascre, at the bottom of the ski slopes. 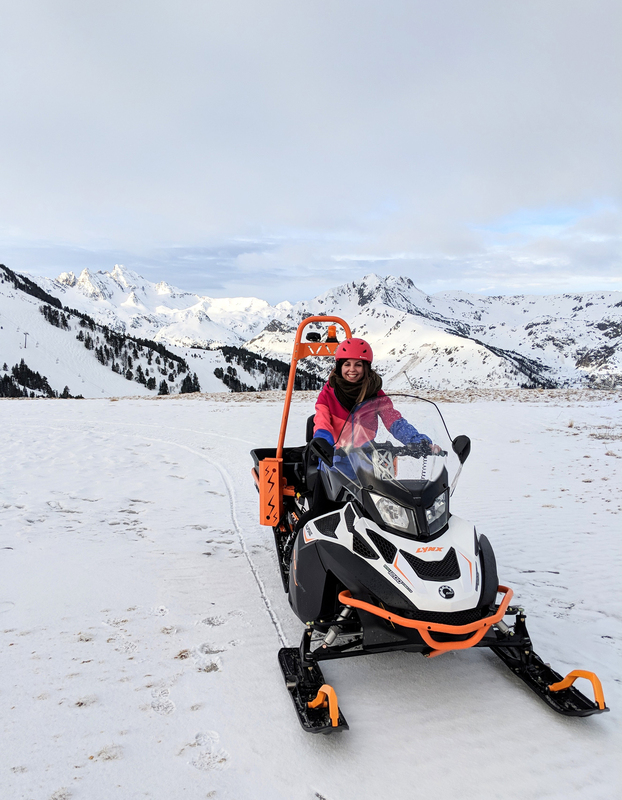 Having never skied before, the wonderful team at Ax-Ski booked us a couple of one-on-one lessons with a ski instructor from the International Ski School, and we were kitted out with ski boots and skis from Nikita Sports. This was hugely beneficial to learn the basics and increase our confidence. 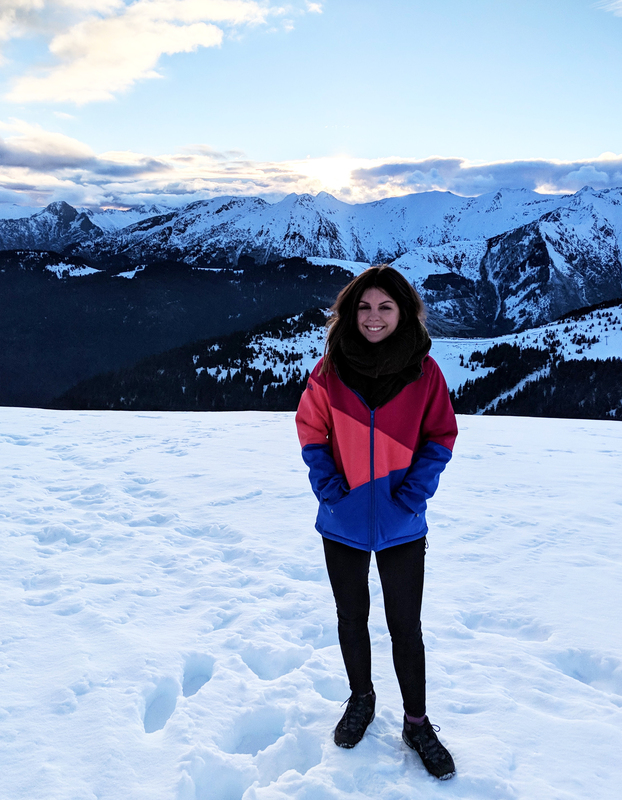 I won’t lie, skiing is pretty daunting for your first time, so I’d highly recommend booking in with a ski instructor – even if it’s just to learn how to use the ski lifts! Being a complete novice, we were first taken on the green slopes (ski slopes are ordered green > blue > red > black). Here we were able to practice our technique, use a variety of different ski lifts, and get comfortable with the equipment, in a safe environment. This really helped calm my nerves, as I felt I could stop and start safely without any whizzing past me, or me getting in the way of anyone’s skiing. However, this is something I quickly learned not to be afraid of. Experienced skiers will always be able to move around you, no matter if you’re in the way or not. You really just have to go for it and not pay too much attention to what is going on around you! Following our first ski lesson, we had a free afternoon where we decided to do some skiing by ourselves, hoping to improve on what we’d learnt in the morning. 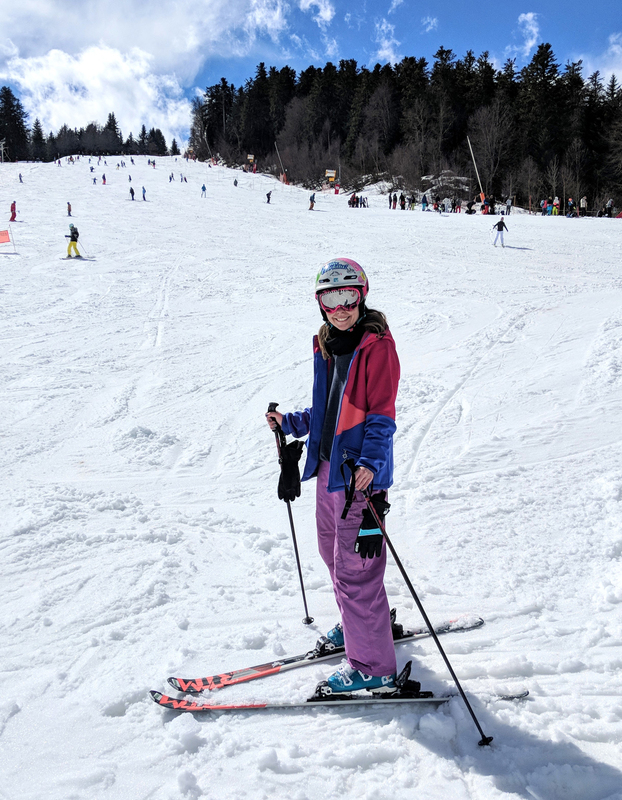 However, I felt uneasy without the ski instructor, I fell over a few times, and each time my skis came off and I struggled to get them back on – being stuck half way down a slope, with Stew at the bottom not being able to help. This really panicked me, but in hindsight I shouldn’t have been so hard on myself. Everyone falls over… and I really mean EVERYONE. It’s so common and we saw plenty of people trying to teach themselves. But at the time, in the moment, I couldn’t think clearly and really freaked myself out. Which was such a shame, because the following day it meant that I had start from scratch again with our second instructor, to get past those nerves. Thankfully our instructor was so lovely, and super calming. He quickly took my sticks off me, and made me learn by just using my feet. This really helped in learning the motions and he took us on a couple of different green slopes, that were a lot less busy. After an hour with him, I felt much better again, but before our lesson was over, he took me back on the slope that I’d had difficulty with the day before. This was pretty scary! Flashbacks from the day before came flooding back BUT I’m so glad he pushed me to do that, because once I’d been down with him, I instantly felt relieved and so proud of myself for conquering my fear. After a lunch we went down the same slope a couple more times, tried a new one, and we were both buzzing. We really enjoyed ourselves that afternoon, not wanting to stop! A complete reversal from the afternoon before. I wish we’d had another couple of days to push ourselves even further and try a blue slope, but either way I’m so grateful for the time we had there. 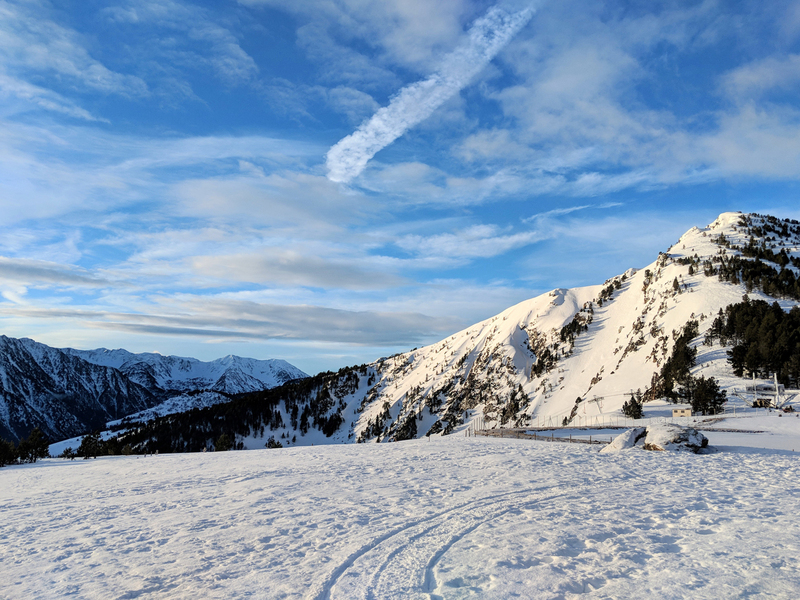 Aside from the skiing, the views at Ax 3 Domaines are incredible! In one direction you are looking over France, and in the other you are looking towards Andorra and the Spanish border. Being so close to Spain, we experienced warm winds during the weekend we were there, which meant that although the resort was covered in snow, it was really quite mild. In fact, it was far warmer than England at the time. We’d packed lots of layers but ended up being so warm and some experienced skiers were racing down in just t-shirts! 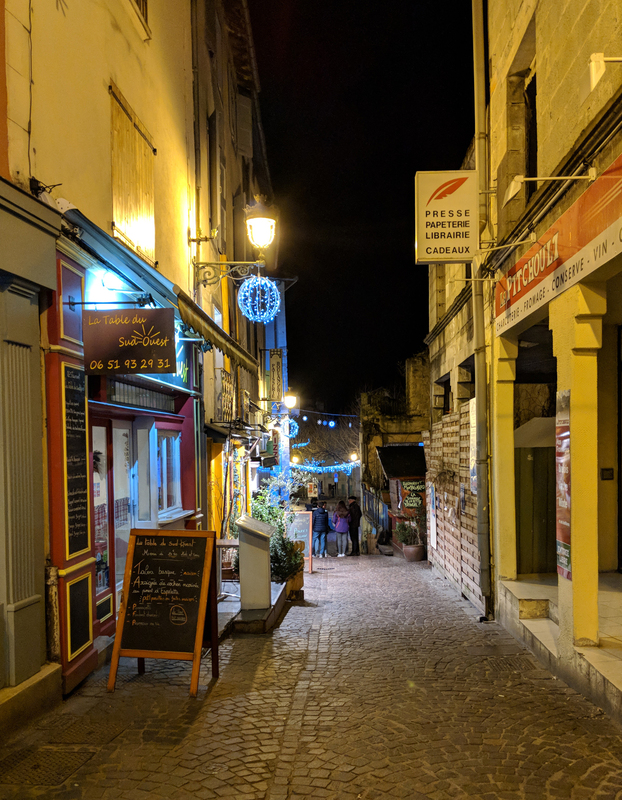 The town of Ax Les Thermes is home to many great restaurants, including Le Chalet, where we ate a delicious meal on our second night. 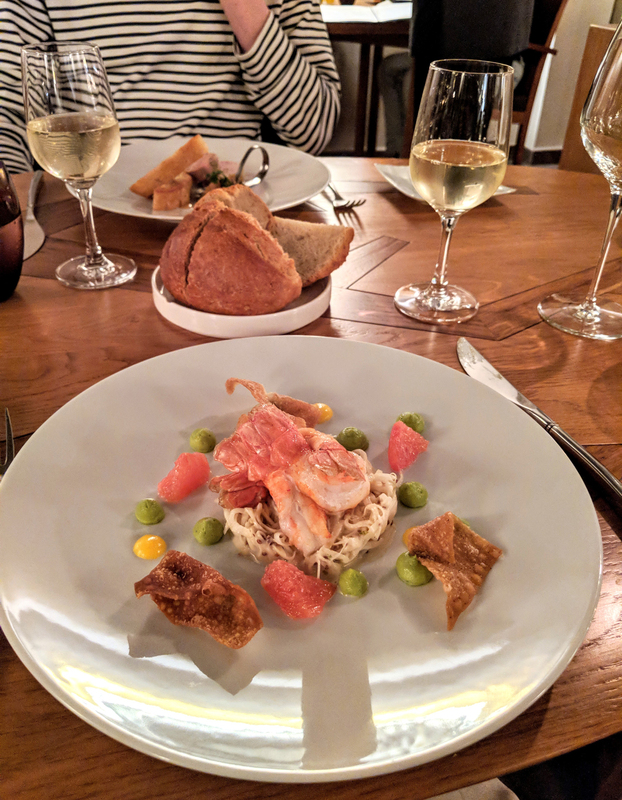 This award-winning gourmet restaurant, serves beautifully presented food and in a wonderful setting. Rich in flavour, each dish was not only fantastically presented, but tasted incredible. We opted for the wine pairing, which I’d highly recommend too. The show stopper was definitely the dessert (pictured below). 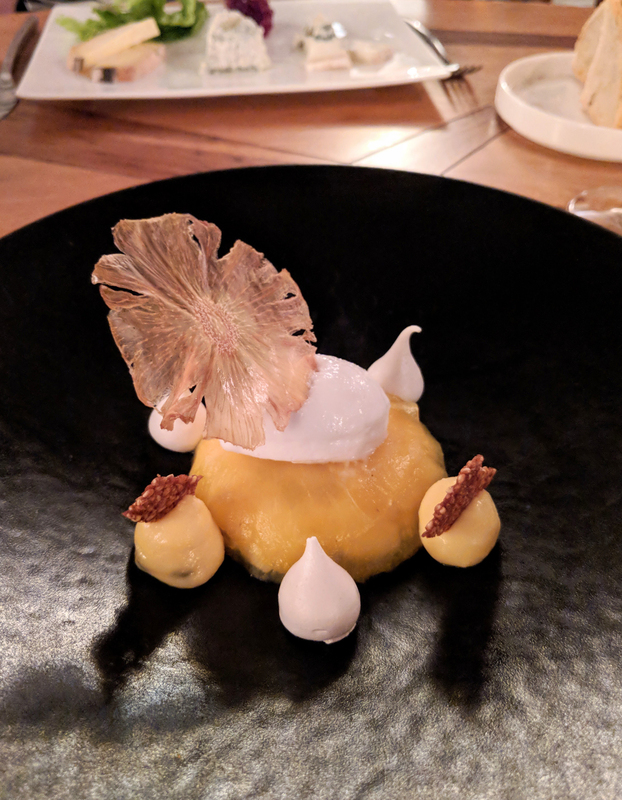 This wonderful pineapple creation included pineapple ravioli, coconut sorbet, sesame brittle, meringue and passion fruit cream. The name may give it away slightly, but Ax Les Thermes is also famous for it’s natural thermal baths. Ax, from Latin ‘Aquae’ meaning water, and Thermes, French for hot springs. These sulphurous hot springs are based up in the mountains, and have are often enjoyed by locals and tourists alike. They were first used by the Romans, and are believed to treat rheumatism and skin diseases. They also offer fantastic views of the snow capped mountains! We sat on the edge and dipped our feet, but others were fully bathing. The water is incredibly warm, like a hot bath. A very unique experience, sat between the snow! In addition to the natural springs, Ax Les Thermes is also home to a man-made thermal bath, offering guests spa, sauna and swimming pool facilities, as well as massage packages. 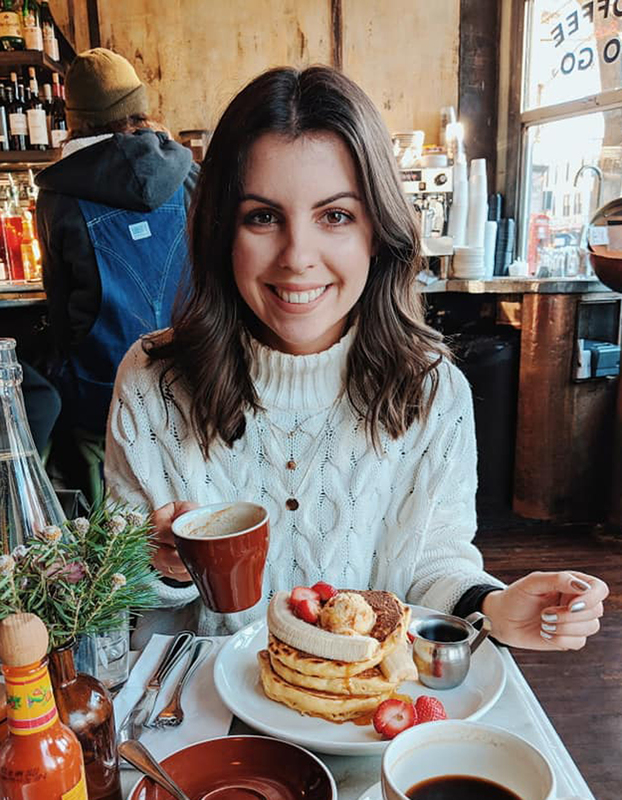 The perfect way to recover from a day of skiing! On our final day, the Ax-Ski team surprised us with an early start, to see the sunrise at the top of the mountain. A beknown to us, we would be traveling in style on a couple of snowmobiles!! This was an incredible opportunity. We were the only people in the ski resort on the mountain, as it wasn’t due to open for another couple of hours. The views were breathtaking and the ski slopes looked even more beautiful with no-one on them. It was possibly the most peaceful experience of my life, soaking up the ever-changing view as the sun slowly climbed above the mountains. Our guide, Yoan, brought his drone along with us, so he was able to get some fantastic footage (both photos and video) of the two of us and the incredible surrounding views. You can see more on their Facebook page. Have you ever been skiing before? Do you enjoy skiing or would you love to try it out? Have you visited the Pyrenees before?